The original Trophy name was used in the "TR5 Trophy" which was made by Triumph Engineering at the Meriden factory from 1949 to 1958. This bike was not the tourer that's known today but more a trials machine designed for off road use. 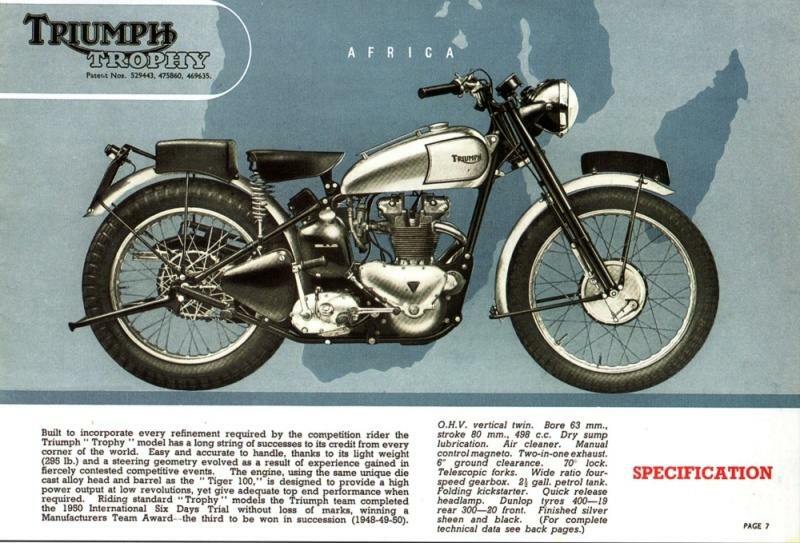 In fact the name comes from the three 'specials' that Triumph built for the Italian International Six Day Trial of 1948. The manufacturer went on to win three gold medals that year and the manufacturers team "trophy". The TR6 followed between the years 1956–1970, but it wasn't until the marque was reincarnated in 1990 as Triumph Motorcycles Ltd before we see any resemblance to the Trophy we know now. There were two bikes, the Trophy 900 and the Trophy 1200. The 900 had the same "triple" engine as the Triumph Trident, a three cylinder engine with a contra-rotating balance shaft mounted at the front of the engine. Add on another cylinder and you had the Trophy 1200, whose engine benefitted from twin balance shafts mounted beneath the crank shaft, a feature unique at the time. 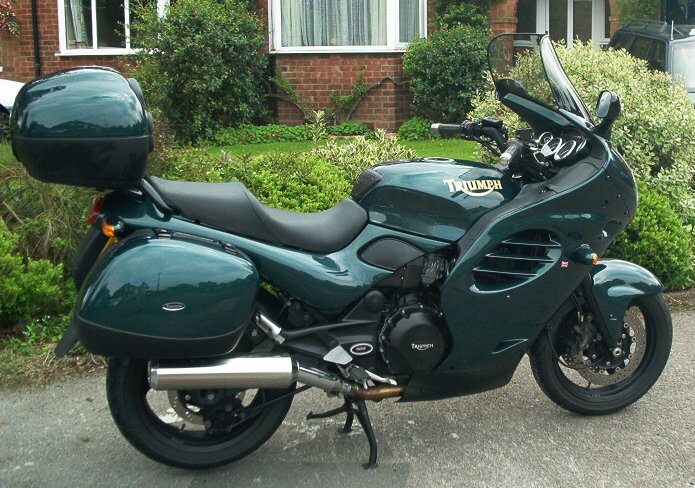 The 1180cc bike was a 141 bhp sports tourer, acclaimed for it's smoothness but criticised in the weight department. 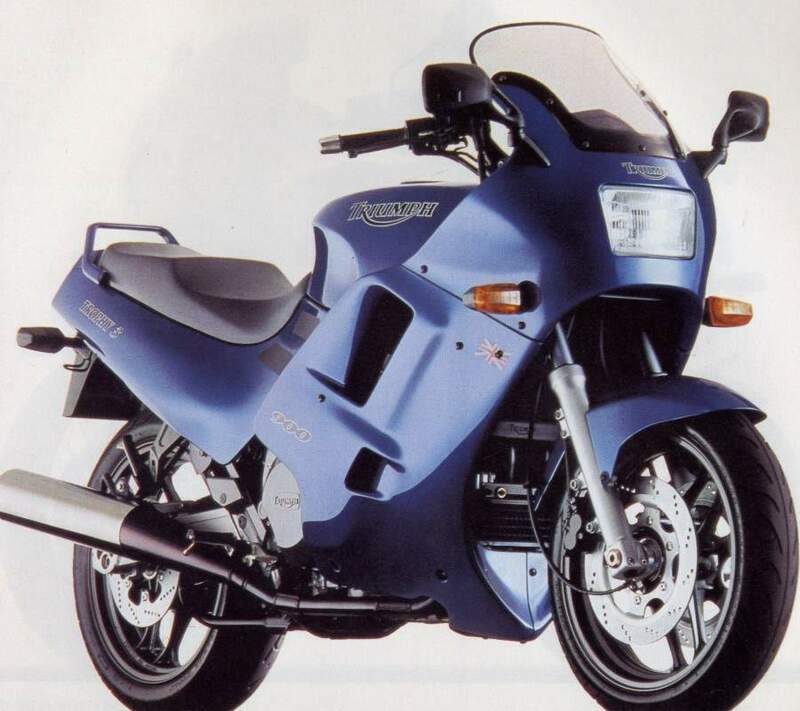 Both models received completely new and much larger fairings in 1995 which were designed by John Mockett. The bikes came equipped with standard fit panniers and a new exhaust system with low slung silencers that allowed the panniers to fit. Apart from the engine, Triumph's modular approach was also employed in the chassis, notably the frame, shared by all six models and based around a single large-diameter steel spine that incorporated the engine as a stressed member. The frame held 43mm forks and a vertical rear monoshock, both from Japanese specialists Kayaba. The Nissin brakes consisted of twin-piston front calipers, with 296mm discs up front, giving braking that was no more than adequate, whilst the back end saw a single rear disc. Although the spine frame design appeared dated in comparison with the latest alloy twin-beam constructions, the Trophy handled very well. In a straight line it was totally stable at all speeds, and barely gave a twitch even in bumpy high-speed curves. Chassis geometry was fairly conservative, and at 5291bs the bike was no lightweight. But the Triumph's steering was neutral, suspension was good and the bike could be hustled along a-twisty road at a very respectable rate. 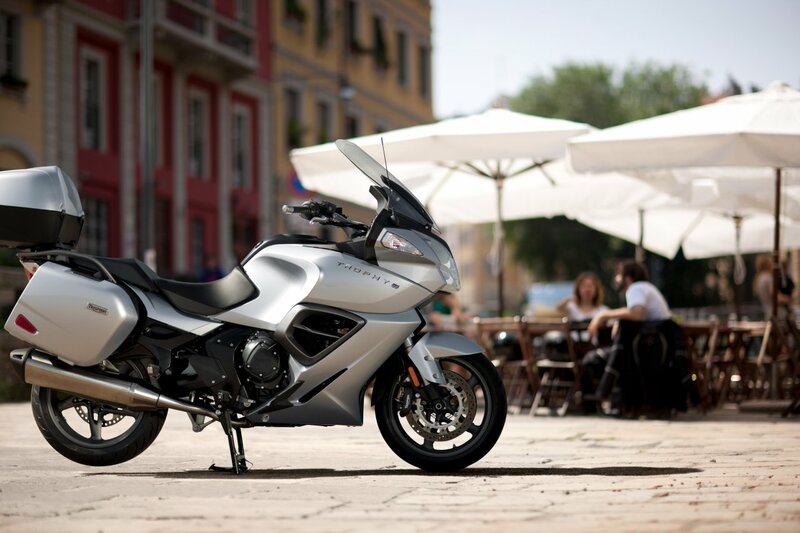 The Trophy's efficient full fairing, large fuel tank and comfortable seat were also well designed. Along with the Triumph's impressive strength and reliability, they combined to create a superb sportstourer that was competitive with other bikes of the time. Few riders complained after they'd tried the Trophy 1200, which became a long-standing success for the British firm. In subsequent years it was refined with features including uprated brakes, a lower seat, improved finish and a clock in the dashboard. In 2002 the Trophy model was discontinued. That was until 2012 when the model was relaunched with the bike we know today.